Houses & Homes VA: How much is too much? Do you feel that the militarization of local police departments is really necessary for our protection in today’s world? 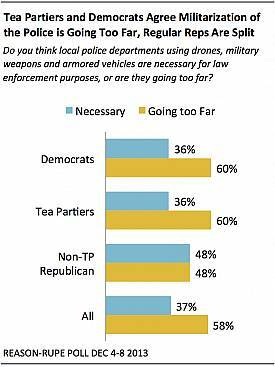 According to the latest Reason-Rupe poll 56% of Americans are not comfortable with many police department’s use of military weaponry including drones, assault rifles, armored vehicles and other types of military grade gear. There was a time not so long ago that police departments did not have access to this type of equipment and if necessary the National Guard would be asked for assistance if a situation occurred that the police did not have the manpower or equipment to handle themselves. This has all changed in our post 9/11 world and many Americans feel “uncomfortable” allowing local law enforcement access to such “high level” equipment. After all, the police are empowered to deal with our citizens, not enemy military factions, right? Usually it is almost impossible for Democrats, Republicans and Independents to agree on anything but in this case 53% of Republicans along with 60% of both Democrats and Independents do agree that the police have been supplied with too much weaponry that, in theory, could be used against U.S. citizens under certain circumstances. It should also be noted that the majority of men and women (59% and 58% respectively) also agree on this topic as well as 67% of African-Americans, 60% of Hispanics and 57% of Caucasians. I can’t remember the last time that I’ve seen so much unity in the United States over a single topic. Yet, even though this poll was conducted in December of 2013 there has been no change in this policy. 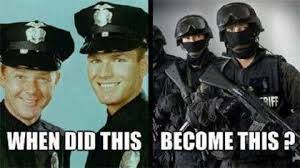 Police departments across the country continue to acquire more and more military type equipment and there seems to be no end in sight. How do you feel about this situation? Do you agree that this type of equipment is necessary in order for the police to protect us? I would love to know your opinion and what you think is best for all concerned.